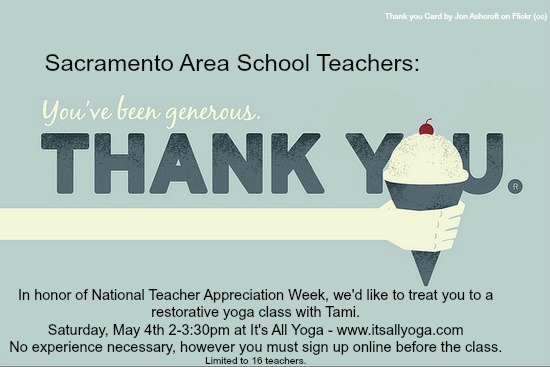 National Teacher Appreciation Week is coming up – May 6-10th and to show my gratitude to my fellow educators, I’m offering a FREE restorative yoga class at It’s All Yoga. Because I know how hard teachers work and I feel like they deserve a little mini vacation during the school year. I’d like to share a little rest and relaxation with my colleagues and friends. Plus I’d like them to indulge in a little self-care. If you are a school teacher in the Sacramento area – you are invited! This class is limited to 16 lucky teachers and will fill up. If you would like to reserve a place, please register online and click the workshops tab. Want to learn more about restorative yoga? Try here. Still have questions? Contact me – Tami – tgbtsblog AT gmail Dot com. How will you celebrate Teacher Appreciation Week? This entry was posted in A Yoga Story and tagged It's All Yoga, National Teacher Appreciation, restorative yoga, Sacramento, Self-Care, self-care for teachers by Teacher Goes Back to School. Bookmark the permalink. Not yet. Try again. I think it should work.